I didn’t go to a historically black college or university (HBCU). Growing up in Hawaii, my only exposure to HBCUs was my parents’ stories about growing up in New Orleans, attending the Bayou Classic. When I left paradise to move to Austin, Texas, I came in search of educational and career opportunities, and a greater connection with my people. Had I learned how to do proper research in high school rather than college, I would have spent time on AOL looking up demographic information rather than meeting new people in chat rooms. Guess that’s what the internet was in 1999. Being in a city that at the time was around 15 percent black (nearly half that now) made it more difficult than anticipated to meet folks who looked like me. I joined the National Black MBA Association (NBMBAA) Austin chapter shortly after beginning graduate school in 2010 in hopes of finally finding that group of black professionals who had eluded me for over a decade. As I continued my research, I found that I wasn’t alone. Many people in Austin find it difficult to “connect” once they arrive here, and in most cases, they’ve come to this city for new jobs in the tech industry. Samantha Rhoden of Prairie View A&M University. Austin has long been considered similar to the Silicon Hills, a not-so-subtle reference to the high-tech companies such as Google, Facebook, Dell, Apple, and others that litter the landscape. What became clear to me is that after 15 years in the tech industry, I was often the only “educated” black man in the building. Which building didn’t matter. Blacks make up less than 5 percent of tech employees and less than 1 percent of tech company founders. In the fall of 2016, fresh off re-election as president of the NBMBAA, I had a conversation with another president in an East Coast city about what makes up a “black Mecca.” I offered Austin as a destination city for blacks, not based on demographics, but because of the numerous opportunities and how well blacks in Austin are doing. My comment was met with a laugh until I explained that Austin rivaled Atlanta with its percentage of black bachelor’s degree holders (26.2 percent for Austin to 26.9 for Atlanta in 2014 – both in the top five in the U.S.). A few brainstorming sessions with friends such as Donell Creech, founder of MVMT50; Tam Hawkins, CEO of the Greater Austin Black Chamber of Commerce; Clarissa Okpaleke, board member of the NBMBAA Austin chapter; and Jonathan Dixon, tech industry veteran), coupled with a desire to attend last year’s Bayou Classic (everyone loves the Battle of the Bands), led to the idea of the HBCU Battle of the Brains competition. The question became when. I’m a veteran of South by Southwest (SXSW). I’ve attended every year since 2009. SXSW is famous for bringing together the best minds in industry as well as the most forward-thinking companies, and investors from around the globe. It didn’t take me long to settle on SXSW as the perfect backdrop for the HBCU Battle of the Brains. Companies such as Twitter, GroupMe, and Foursquare launched at SXSW over the years, which creates excitement about what’s to come next. We were about to be next. 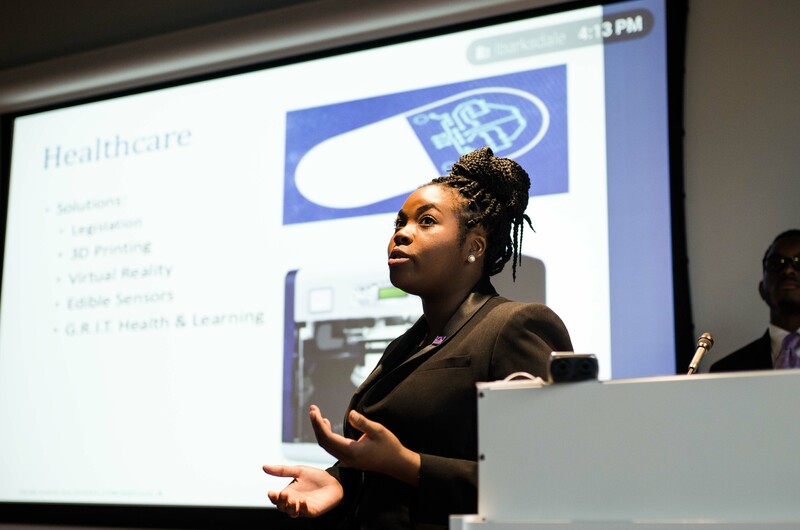 The goal was to expose HBCU students, undergraduate and graduate alike, to the opportunities, as well as providing access to the tech companies housed here in Austin. The premise was, if we can have these companies and investors observe these talented students over the course of a weekend, those individuals couldn’t help but be impressed. But we needed a hook, and a competition was seen as the ideal draw. Everyone in the tech industry loves a hackathon, and the National Black MBA Association is famous for its case competitions. We thought we’d put our spin on it and create a hybrid of the two, allowing for schools to create mini-corporations to compete in this inaugural event. Once we were locked into hosting the HBCU Battle of the Brains, we immediately moved to “How?” Did I mention that I didn’t attend an HBCU? I wasn’t well connected within that community either. I mean, it’s not like there’s an online database of HBCU presidents and faculty members to reference. We spent a week or so digging up contact information for presidents and chancellors around the country, wanting to cast the net as wide as possible, with the hopes of sparking interest in participating in an event in such an infantile state. Speaking to the bold nature of the venture, I was pulled aside by one of the HBCU faculty members during the weekend who stated, “I had to meet the guy audacious enough to email 100 HBCU presidents directly!” I responded, “Rule No. 1, start with the decision maker.” Now that we had spoken it into existence, we had to find support. We believed that we would be able to pique the interest of tech companies as they are just as aware of their diversity issue as we are. Google (and Google Fiber), Atlassian, Amazon Web Services, Facebook and others in the tech community saw the vision and worked to pull resources together. Non-tech companies such as Farm Credit Bank of Texas, State Farm and H-E-B also made vital commitments to ensure the success of the event. The NBA spearheaded the support from the sports community. That was further extended by in-kind contributions by Cedric Griffin (former Minnesota Vikings cornerback), as well as Aaron Ross (two-time Super Bowl champion) and his wife, Sanya Richards-Ross (four-time Olympic gold medalist), and their associated companies. With all of these entities focused on creating a great experience for these students, we believed we were ready. But for what? It had never been done before. We were hopeful though. Who would be the early adopters? The first registrant would be Prairie View A&M University. Then came Morgan State University and Florida A&M University. If anything, it told us that it was a good enough idea for schools to travel to attend it. In the end, the charter members of the HBCU “BOTB” club included the above schools, as well as North Carolina A&T University, Philander Smith College, Paul Quinn College, and our hometown Huston-Tillotson University. We now had a quorum. Before we knew it, the students had arrived. Lunch, a brief introduction, and at 1 p.m. March 10, they were handed the case. And in 24 hours, they would be solving all of the world’s ills while providing an outline, go-to-market strategy, executive summary, and technical solution (website, mobile app, etc.). It wasn’t easy, and it wasn’t supposed to be. It was supposed to stretch these star students to their limits in front of these industry heavyweights to show just how talented they were. And they didn’t disappoint. 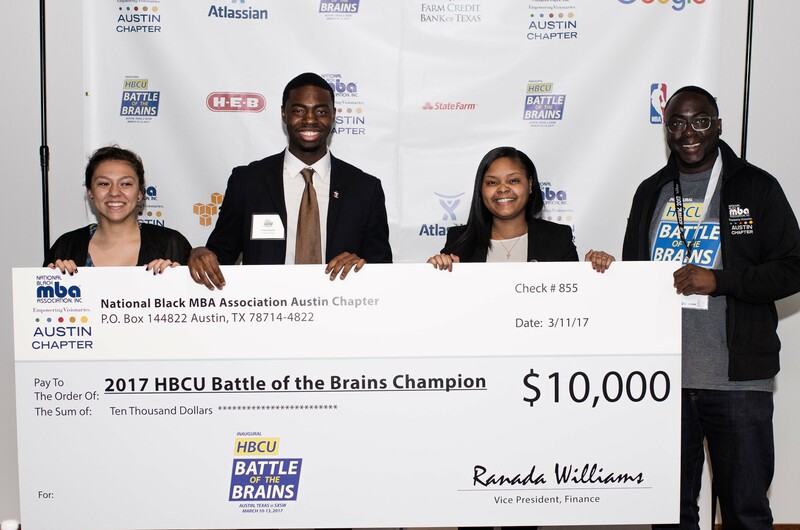 When the dust settled, the 2017 HBCU Battle of the Brains champions were the Tigers of Paul Quinn College of Dallas. Winner of the inaugural HBCU Battle of the Brains, Paul Quinn College’s Hannah Backus, Vincent Owoseni and Destiny Modeste, with BOTB founder Gregory Gibson Jr. This year served as a pretty good pilot for what we were trying to accomplish. There were lessons learned that we will apply moving forward, and opportunities to make the competition even more impactful in the years to come. We’ve only just begun.